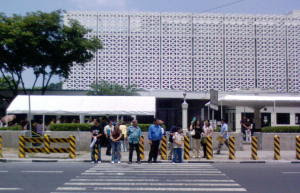 I haven't been to the US Embassy in Manila for a long time. The other day, my dad asked me to accompany him to get some documents and inquire about something. A tip for those crossing UN Ave towards Bayview Hotel. The red light for pedestrians never turns green. We waited for more than 5 minutes patiently hoping the red man sign would turn green but it didn't. We had lots of chances to cross the street but simply didn't cause the UN Ave-Roxas Blvd. intersection was swamped with MMDA traffic officers. They didn't seem to care though about the pedestrians since all they were trafficking were the vehicles. Upon crossing Roxas Blvd, we were greeted or rather approached by people who were offering photo ID services. They even had a lot of samples of ID pictures and sizes stuck on a long folder for display. It kinda looked like a friendster page to me. I was warned by my friend not to bring a celphone but I forgot, and I didn't want to leave it in the car. There were 2 lines you needed to go through before entering the Embassy premises. One was for security to ask what's your business. You go through a 2nd line where only 2-3 people at a time can enter. Once you get inside, you'll pass through their security door similar to those in the airport. I was asked to pass around 3-4 times, with each time, unloading something that could possibly trigger their alarm. First was my celphone, then my mp4 player, followed by my keys, and last were the several coins in my pocket. The alarm still triggered and I told the guard that I have nothing else metal on my body except my belt. Thank God he didn't ask to have my belt removed and took my word for it. Next up was to surrender all celphones. I saw a sign nearby that said "Celphones are not allowed for VISA applicants." I told the guard that I wasn't applying there to apply for a VISA. But he said that there are no exceptions. That was really weird and I didn't want to argue so I just surrendered my phone. I even forgot to turn it off. You need to provide an ID for each item you're surrendering. I was also asked to surrender my MP4 player perhaps because it looked like a phone. And so I had to surrender a total of 2 IDs. Finally, we got to enter. You'll pass through several doors depending on where you're headed. And these doors are heavy ! It was tiring trying to exert much effort to open each door. No wonder some people, would let you pass them. So you'd open the door and they'd follow you to avoid the effort. We got to the inquiry area where we had to pass through another security door and leave an ID in exchange for a visitors pass. I was running out of IDs and good thing the guard accepted my credit card instead. There were lots of people inside. We had to take a number and be seated. It took us around 45 minutes before our number was called. Good thing I brought a book with me. Unfortunately, I didn't realize the title of the book I brought was entitled "Inside Internet Security - What Hackers Don't Want You To Know" and suddenly let out a slight tremble, for fear that I may be perceived as suspicious or a threat (to National Security?). And so leaving the premises, I held the book so that the back cover was showing instead of the front. It was a unique experience sorta like going through a maximum security penitentiary. I'm just glad I don't have any business which will require me to visit the US Embassy in the near future.